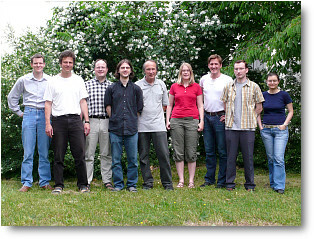 The foto shows current and former staff, from left to right: Xiaodong Liu, Olexandr Bondarenko, Tilo Arens, Marc Mitschele, Janina Stompe, Thomas Rösch, Frank Hettlich, Thomas Henn, Muhammad Anwar Hussain, Andreas Kirsch. Further down on this page you will find the list of current staff. You find our group on the first floor of the newly renovated building 20.30 of KIT Southern Campus (facing Engler-Straße, direction north-east). 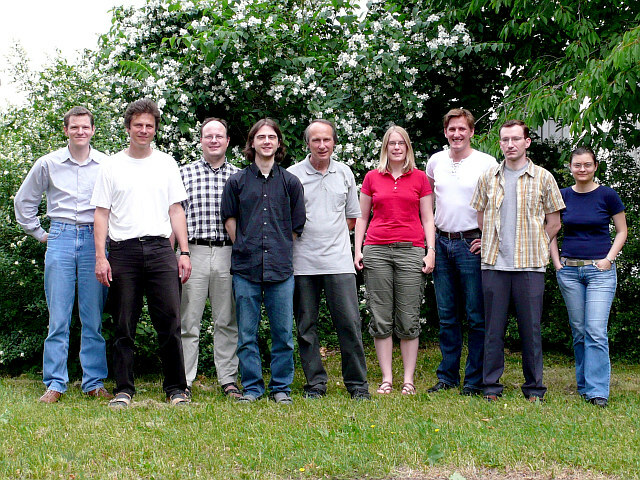 Our work group is mainly concerned with inverse problems, and particularly with inverse scattering problems. Such problems are ill-posed in general: small errors in the data can lead to completely wrong results. We also consider the mathematical formulations of the corresponding direct problems, e.g. time-harmonic scattering problems or boundary value problems for elleptic partial differential equations and their numerical solution. More specific information can be founf on a page with the description of our Research Areas. Their is also a regular meeting on inverse problems. Our work group is responsible for the classes on Advanced Mathematics I-III for studens of mechanical engineering and of the courses of the faculty for chemical engineering. We also offer lectures and seminars on mathematical topics such as integral equations, inverse problems, the Helmholtz equation or Maxwell's equations. Further down on this page there is a list of current classes.